I promised the story of my recent acquisition of June Hemmons Hiatt's Principles of Knitting. I am sure some question why I just spent about $140 to get this book when there are all sorts of posts out there that say it will be reprinted in a revised edition in the fall of 2009. The answer resides with the little girl with the owl in the picture in my last post and all sorts of memories - having nothing to do with knitting - with which the book connects me. Mom and I would go to those readings each month, often with her friend Virginia Ormsby. Virginia wrote poetry and sometimes sent cute handmade cards with little watercolor sketches. I didn't know until the mid-90s that she had written and illustrated numerous children's books in the 60s. Here is a link to one that someone has in a Flickr photo set of vintage children's books. I have occasionally seen her son Eric's poems in The New Yorker. I loved going to read at those readings with these older women. I had four children at home, two of them under four, one in middle school and another in high school. Getting to go to those readings and be in the world of words and performance....ahhh, it was bliss. Yet there was something not so blissful - a sort of clique among some of the regulars and, as I look back, an ageism that put my mother and Virginia into that space that older women often find themselves. A space where they are invisible, and not taken seriously. My mother felt it - she remarked once that they were never included in invitations for post-reading socialization. She said they were usually ignored on the nights that I was not with them. I have to admit that I was not as appreciative of their poetry as I could have been. I never dismissed my mother's work, but it was, in style and subject, not poetry that truly resonated with me. 'Hearts and flowers,' I used to label it. Between the two of them, George-Anna and Virginia had an enormous amount of writing and publishing experience. I salvaged from that flooded storage unit, scrapbooks which contain poetry published in newspapers from the time my mother was 10 years old. ( She even, for at time at thirteen, published under a pen name, George-Anna Cary, adopting the last name from her paternal grandmother's side through which we are cousins of the 19th century poets Alice and Phoebe Cary.) In other scrapbooks are page after page of columns and articles she wrote for small newspapers. As an adult, she was published 29 times in the Christian Science Monitor. Good Housekeeping printed one of her essays and the Reader's Digest digested it. There's more, those are just some highlights. I wish I could remember more about Virginia and her work. In my memory, she is simply Mom's friend, a small white-haired woman, with lively interest in things, an aura of kindness and quiet intelligence about her. Maybe that is enough to remember. So. One of those literary nights, we arrived early enough to browse books before the reading. I had just taken up spinning with a spindle and my interest in knitting had been re-kindled. 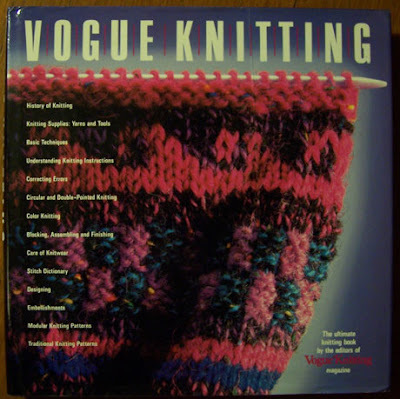 I remember I was looking at two books that were just out: Vogue Knitting / the ultimate knitting book and Principles of Knitting. Both were pricey in 1989: $34.95 and $29.95 respectively. I couldn't really afford either one. Mom, frugal in her own spending for herself, was always impulsively generous when it came to others. "Take them both," she said, " I'll buy them both for you." I demurred only an eensy bit. To cut to the denoument of this tale, some time in the mid-90s, I felt the need to pare down my library, to have some space on the shelves and let go of books. (That little need turned into my life as a used bookseller, yet another story entirely.) Anyway, I decided that one of the books needed to go -- Vogue, which had color photographs and more stylish layout, took up less than half the shelf space as Principles. And so I sold Principles for a pittance and gained a few dollars and an extra 2 inches of shelf space and a nagging guilt. How could I sell one of the books my mother so generously gifted me with? Knowing that she would have understood completely did not lessen the guilt. And a few years ago, when I decided I wanted to get back a copy of the book, I was stunned to see what had happened to the price in the out-of-print market. Used copies were priced at $200-400. Even on eBay for a time, most copies sold in the $200-250 range. So. 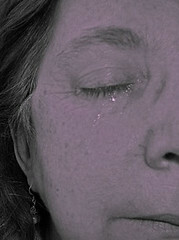 Mom died last Feb. 14. Her estate was settled while I was recovering from my appendectomy. And a couple of weeks ago, she bought Principles of Knitting for me again. I have a book or two that has returned to my shelves after I did some cleaning out. So I totally understand. Some day I'm going to pick up knitting. My mom knitted like crazy and I still have sweater or two from my teen years floating around. She tried to teach me and it didn't stick, maybe it's time. Your post caused me to stop and consider. Somehow I lighted upon it minutes after it was written last evening and I was inspired to clarify my rationale for the acquistion of this title. 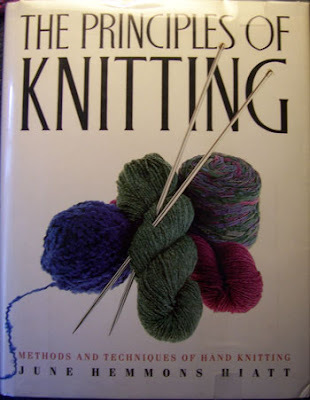 I bought the book a few months ago as a connection with my mother (who is teaching me to knit) and with my grandmother (who would have willingly and lovingly taught me had I asked - and I regret that I never did). 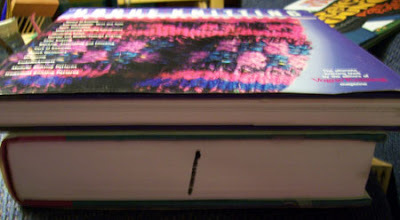 While I have no previous relationship with the book - per se - I was drawn to the art of knitting and wanted a comprehensive reference to guide my knitting journey. How wonderful that you can reclaim your connection with the book, with knitting and with your Mom. Linda, Donna - I'm here!